From insecurity and helplessness to procrastination and wanting to give up, anger can make your work-life a struggle. 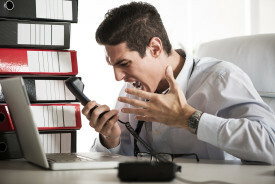 This may come as a surprise, but anger can also benefit you at work. Anger is a normal, healthy emotion; it can sharpen your focus, make you feel more confident, motivate change, and stimulate your creativity and productivity. Before you can channel your anger to benefit you, though, you have to first learn how to not let it boil over. Think of your mind like a snow globe: As soon as you pick it up, you notice how stirred up the flakes inside become. When you set the globe down, you can observe it settle. When you take notice and examine your thoughts and feelings they appear to be swirling around much like the snowflakes. To clearly recognize what’s happening in your own mind, you have to allow things to settle, and in order to make your own mind settle, you have to learn how to be still yourself. You can use mindfulness to better understand those swirling emotions and help you reduce or eliminate conflict with others at work. After all, relationships with your co-workers and supervisors are the central part of your work-life. By using mindfulness, you can learn how to handle your anger while you’re sitting at your desk.